2012 Olympic site perimeter fence, Lea Valley. © Homer Sykes 2007. This week we are featuring a few of Homer Sykes’s images of the Lea Valley immediately prior to its transformation into the 2012 Olympic ‘zone’. 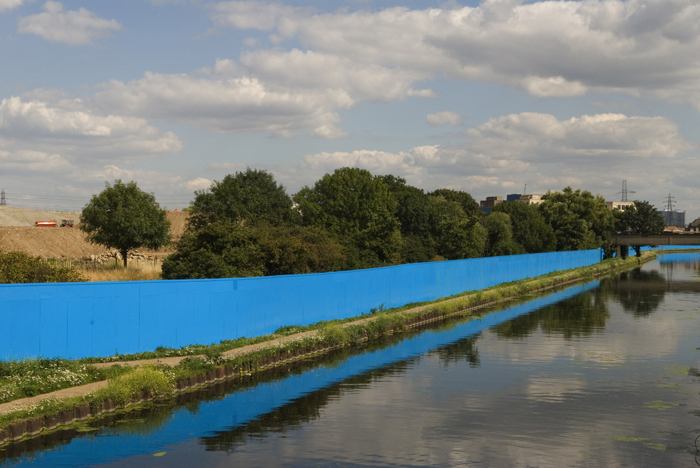 In 2006, searching to record for posterity a neglected moment in time, Homer made it his personal mission to explore the future site of the Olympic Park – soon to be encircled by a barrage of hype, and by the anonymous and blandly forbidding Blue Wall. Indeed, the blue wall shown in the picture above was the most visible token of the impending funfair – and it served as an unwittingly potent symbol of loss. In these images, Homer shows what was there before: a curious mix of wildflower meadows alongside neglected sports fields, semi-derelict 19th century industrial buildings sprawling cheek by jowl with unidentifiable dwellings cloaked in ivy – an almost rural atmosphere emanating, against all odds, from the urban blight. Cities are organic entities, and London has, traditionally, ebbed and flowed as entire districts go in and out of fashion, or are repurposed in the light of changing circumstances. Elsewhere on The London Column, we have railed against the imposition of corporately-sponsored ‘Regeneration’ schemes upon areas that have developed their own post-industrial ecosystems: those intriguing backwaters where town becomes wilderness. Sadly, these romantic urban oases are too easily seen tabula rasa for this or that grand scheme – which are invariably sold in as a boon to the local community. But one only has to look at the dislocated, dystopian landscape of ‘North Greenwich’ to see what happens to an event site after the event has gone. Homer will be presenting a slideshow of images from Before the Blue Wall at the Green Lens Gallery, 4a Atterbury Road, London N4 1SF, on Wednesday 11 July between 6 and 9 pm. Homer’s website is here. Urban regeneration programmes have infact simply been voodoo forms of regeneration.Promising “trickle-down benefits” that never seem to materialze. Indeed its more trickle-up or out that takes place.The problem is that they provide surplus capital with positive returns and so remain very attractive to developers who are more than keen to grasp the subsidies that flow and then re-cover their costs within a few years and then are able to “cash-in” their investment when it suits. There is no commitment to place or people, its simpy a project mentality that prevails.